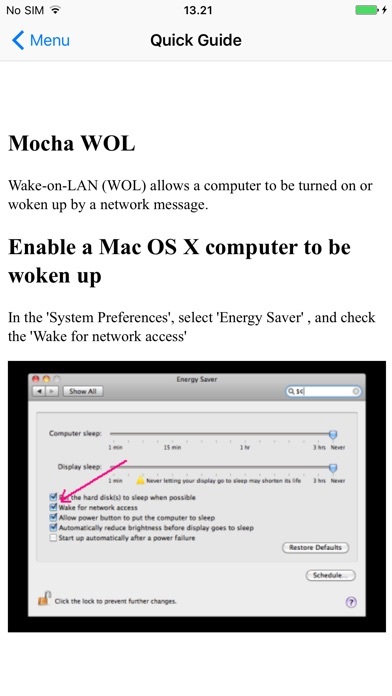 Wake-on-LAN for easy wake up calls. Use your iPhone or iPad to power up a sleeping Mac or PC on your network. FEATURES: - Easy detection of local computers with Bonjour and NETBIOS lookup. - Can ping your computer to check, when it it is ready. - Broadcast on a LAN. - Works from other networks as 3G and WIFI. - Can keep 30 configurations for computers to WOL. - Build in help guides. HOW IT WORKS: When you select a computer to wake, a special UDP data frame is broadcast on the LAN. When the sleeping computer see the data frame, it will wake up. If the iPhone or iPad is on another network, such as 3G, you must first configure the HOME router to forward the special UDP package. The app works. That’s the most important thing. It DOES work. But the interface is pretty awful. I’ll deal with it, though, because the app does exactly what it needs to do. A spartan app, which works as advertised - I have a couple of computers I want to wake while on my home network, and I can use this app to wake them up. A couple of feature suggestions that could make this app great: * Ability to show status from the main screen * A “force touch” menu to wake a computer. To wake up already configured host, one has to do several taps. This is inconvenient. It would be better to have configured hosts as icons on the first screen to wake selected immediately. 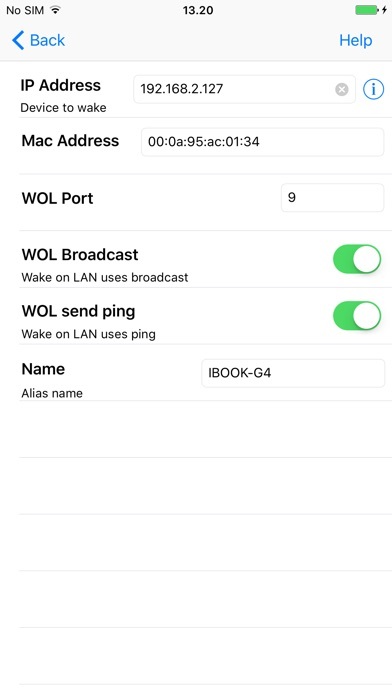 Just found this app for Wake on Lan & Wake on Wan as I was looking for a replacement for a 32-bit app I had been using for years. With iOS 11 I can no longer use that app & found Mocha. Thank you Mocha. Seriously. I'd make one suggestion for the app, it'd be nice if we could choose to have the "wake up" screen show up when first opening the app. Other than that, this is great. What more do you need from a tool that sends a single packet? I liked the app when I got it last year on with the old UI. Love the app now with the new UI. Big thanks to the dev for such a great app and for their continued efforts to keep it modern. Rejoice! OP is not dead! 4.5 years later we finally get a better looking UI. Looks great on my 6S+, and still works, too! The new UI is much cleaner and this is a great simple app for waking up computers on your network. I think the only problem is it needs to be a little quicker to get to the actual wake up button. The menu item should be above the configure option since you will be waking up more often than configuring and with more room open at the bottom of the screen at the initial menu page, it would be nice to have a larger "wake up" button that wakes up your top IP address. 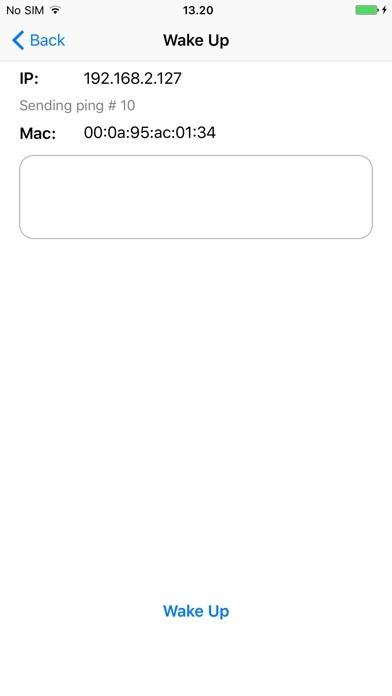 That way a click to open the app and a click of that button could send the packet. 2012, 600Kb and still ROCKS in 2016! This is an example of programming done right. 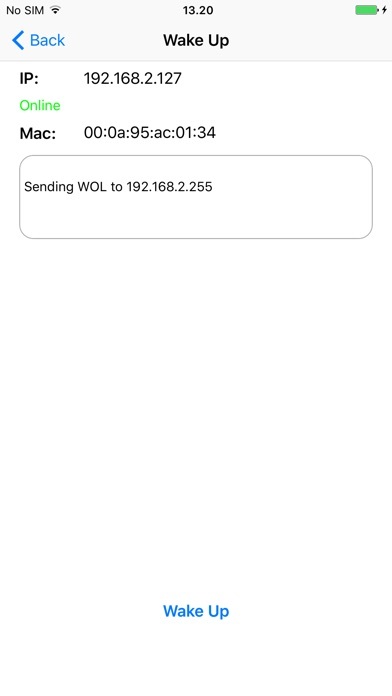 I don't know how this is on ios9 (I have 8), but unlike FING this app can wake even if I don't have an IP from the dhcp server (because the dhcp service is offered by the server that I want to wake up and the phone autogenerates 169.254.x.x address). Thank you so much!